Buddhism is regarded as a major world religion and a philosophy; it is based on the teachings of the Buddha, Gautama Siddhartha , a prince of the Shakyas, who lived in or around the fifth century BC. The teachings spread from their roots in India to most of Asia. One is Southern route Buddhism (mainly Thailand, Sri Lanka), another one is Northern route Buddhism(Tibet, China, Korea and Japan. 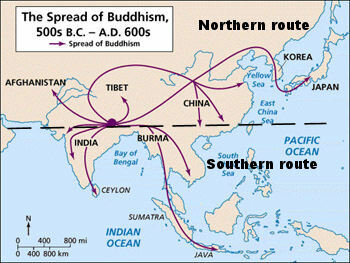 Active Northern route Buddhism are believed mainly in Tibet and Japan at present). In southern route Buddhism, people have seeking for goal individually as getting an advice from priest. That’s why their important sculpture is Budda only. It’s called Sthaviravada (Theravaada, Jozabu). On the other hand, in northern route Buddhism, people got together and established a religious body. everybody helped each other. and Vajrayana (Daijo and Mikkyo). The goal is understanding, awaking, and realizing to truth. Buddha said that ‘being alive’ is same to ‘suffering’. To get rid of suffering, we have to abandon our desires. Desires are cause of sufferings. Buddhism sculptures and items are an object of faith as a believer. But these items are the work of art for everyone simultaneously. We are expected to increase numbers of item. We will introduce genuine　items in this web site. We provide Japanese Buddhism item basically. So, we write Buddha’s names at Japanese pronunciation. This table is the list of Japanese – English pronunciations. These names are representative Buddha only. Nyorai (tathagata) is Buddha who had spiritually awakened. Southern route Buddhism have Shaka Nyorai (Gautama Siddhartha) only. Northern route Buddism have some Nyorai. They have tendency to be the principal image. They are leading us to truth as doing ascetic practices. In Northern route Buddhism, they are an object of belief. Myo-oh (vidya-raja) is incarnation of Nyorai in vajrayana Buddhism. They lead a obstinate person who don’t understand Buddha’s teaching to truth by force. So, their faces are getting angry. But it’s mercy from Buddha. Ten (deva) are old Hinduism deities originally. Buddhism took in them to Buddhism, they became the deities that protect Buddhism. Gongen is quite Japan origin Buddhism image. Gon means temporarily. Gen means appearance. I mean, Gongen is Buddhism figure who appeared as Japanese Gods and goddesses temporarily (incarnation of Japanese God). That’s ancient Japanese sapience to avoid religious conflict between Shinto and Buddhism (called Honji-Suijaku thought). This idea itself is not Japan origin. It appeared in China and India also before Japan. These Buddhism deities who brought from other religions are called “Goho-Zenjin (Dharmapala)”. About details, please read here. No English name, because these images are Japan origin.